Great work Joe. 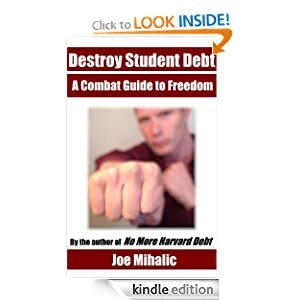 Getting down into the nitty-gritty of how to manage money in order to get rid of student loans, and any other form of debt, is incredibly valuable. Thank you for taking the time to share how its done. This is so awesome! I will be following along step-by-step! I’m also sending this out to everyone I know so they can follow as well. You look good and everything sounds great. Thank you very much for doing this! Hey Joe, it’s great to see you back up and blogging again! It’s also awesome that you’re sticking to your guns and keeping your content free – I’m sure everyone who subscribes to NMHD will agree with me. Your blog inspired me to write about my experience of selling everything I owned within 3 weeks, as I was approved for a US Visa and had to move to the USA (from Australia) quickly! I’ll send you an email separately with some specifics, but I’ve put together a step by step guide called ‘From Trash to Cash’ that I’d love you to take a look at. I will add my happiness that you are back, Joe. You have been sincerely missed! Thank you Joe!! I’m so grateful for this! Can’t wait for the rest of the series, looks great! I’ve been following a budget, but I always love to hear more insight as to how others manage budgets, and more importantly stick to them. Great stuff! We must be disciplined when handling our budgets. Positive cashflow is the key to financial success. Most people operate in a cashflow failure.